Delivering power when you need it, the Mighty Max ML22-12GEL 12 Volt 22 AH (Maintenance Free) battery. Requires no addition of water during the life of the battery. 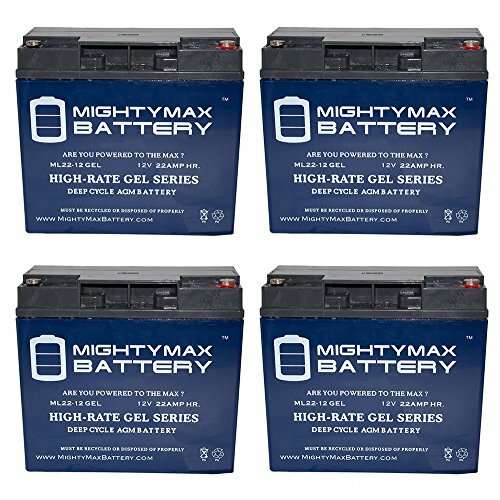 The Mighty Max ML22-12 GEL is a TRUE DEEP CYCLE battery that can be mounted in any position, requires no maintenance. When a Gel Cell battery is charged, no hazardous fumes escape the battery case, gases are processed within the battery itself. Dimensions: 7.13 inches x 3.01 inches x 6.57 inches. Terminal: Internal Thread. Listing is for the Battery and Screws only. No wire harness or mounting accessories included.